I want to talk about this song’s drum track. When the Great Paul Thompson (as his fans called him) left Roxy Music in 1980, Bryan Ferry, possibly at the suggestion of producer Rhett Davies, did what most musicians in his position would have done: he called in a session player or two to fill the gap. On 1980s Flesh & Blood, one of those players was Andy Newmark. On Avalon, two years later, Newmark would drum on eight out of the album’s ten songs. It’s hard to go wrong with Andy Newmark. If a drummer’s good enough for Sly Stone (Fresh), John Martyn (One World), John Lennon (Double Fantasy), Laura Nyro (Season of Lights) and Randy Newman (Good Old Boys), he’s good enough for you. He’s a magnificent player, but seldom a showy one, and his work on More Than This is as unshowy as it gets. A mid-tempo groove, slightly on the brisk side, two and four, bass drum in quavers, no big fills – this is a drummer playing for the song, with just a few interjections (mainly on tom-toms, and short press rolls going into choruses), to make the track his own. Newmark’s judgement about how much to play is perfect, although it’s worth noting that his gig was to come in when the songs had been all but finished, with full arrangements built up over programmed Linn Drum patterns, and either augment or replace the Linn groove. 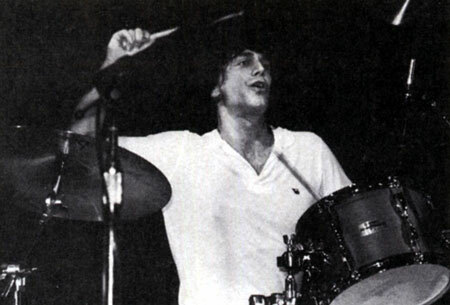 Although playing to pre-recorded songs necessarily puts the drummer in a different position than most are used to – partly because the amount of available space in the arrangement is decided for you, but also because as in this situation the drummer isn’t the song’s engine, as the tempo is locked – it does provide unusual challenges, foremost among them being the insertion of a feel, something other than completely rigid, mechanically perfect eighth notes of unvarying velocity. How much you can swing against the track (a full arrangement, remember) and have the whole thing still work, well, that’s a big part of the game. And Newmark is a master at it. Of course, session drummers had existed almost as long as there’d been a recording industry (and certainly since rock’n’roll bands started showing up whose songs and/or star quality ran ahead of their musical chops), but in the studio environment of the 1980s, the session drummer suddenly had this whole new avenue of work open up for them (it started with disco really, as consistency of tempo was a big deal in that style) – it wasn’t just about solo artists calling a drummer up to play on their record because they didn’t have a regular band. The successful ones, like Newmark, adapted themselves brilliantly to this new environment. But evolution was forced on all musicians in the brave new world of automated consoles, polyphonic synths, drum machines, samplers and sequencers. This is a Roxy Music track where Bryan Ferry is dominant almost to point of elbowing out his bandmates completely. Phil Manzanera is present in the intro but is almost immediately pulled right back in the mix, and thereafter pops up now and then to play little variations around his main riff, and only returms in the long fade. Andy MacKay, meanwhile, plays all of seven notes throughout the whole song, all sustained, all easy to miss if you’re not paying attention. Whether it was his choice, Ferry’s or Rhett Davies’s, it’s another admirably disciplined and selfless performance on what for my money is the finest song Ferry ever wrote and the best record Roxy ever made. This entry was posted in Music and tagged Andy MacKay, Andy Newmark, Avalon, Bryan Ferry, click tracks, Double Fantasy, drummers, drummers who can drum/singers who sound like sheep, Flesh & Blood, Fresh, Good Old Boys, John Lennon, Laura Nyro, Linn drums, mixing, pad, Paul Thompson, Phil Manzanera, press rolls, Randy Newman, record production, records that sound great!, Rhett Davies, Roxy Music, Season of Lights, session drummers, Sly Stone, sound recording, synth, the eighties, toms on July 6, 2013 by rossjpalmer. I enjoy your musings. It was Allan Schwartzberg on Flesh + Blood. Thanks Sean! I appreciate that. 🙂 I thought Newmark was on the tracks Flesh and Blood and My Only Love and Schwarztberg played on the rest. Sure sounds like Newmark on those two to me.